Written by an author who has devoted the past twenty-five years ofhis life to studying and designing shock wave engines, this uniquebook offers comprehensive coverage of the theory and practice ofshock wave engine design. The only book treating the completepreliminary design of shock wave engines, it provides engineerswith practical step-by-step guidelines applicable to the design andconstruction of small, light- weight, low-powered industrialturbines as well as high performance jet aircraft engines. In his discussions of the advantages and disadvantages of shockwave versus other types of combustion engines, Dr. Weberdemonstrates how and why shock wave engines can be made to workmore efficiently than conventional gas turbines. Among otherthings, he shows quantitatively why combustion temperatures can besignificantly higher in shock wave engines than conventional gasturbines. He evaluates temperatures of moving parts in terms ofcombustion and engine inlet temperatures, and explores the effectof shock coalescence, expansion fan reflections and intersectionson port sizes and locations. And throughout, real and imaginedperformance problems are posed and proven solutions given for shockwave engines--alone and in conjunction with conventional gasturbines or reciprocating internal combustion engines. Designed to function as a practical guide, Shock Wave Engine Designoffers concise step-by-step design techniques in a readily usableformat. Engineers will find precise, detailed directions on suchessentials as how to size wave rotor blade lengths and heights andthe correct rotor diameter for a specified power, and materialselection for rotor and stator. 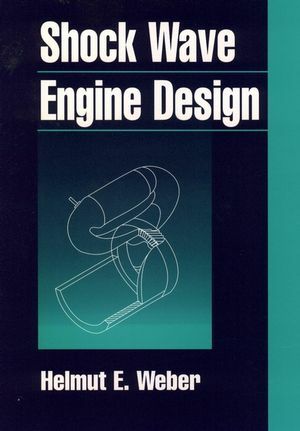 And one entire chapter (Chapter 12)is devoted exclusively to a detailed example design for a 500 hpengine. An authoritative, highly practical guide to state-of-the-art shockwave engine design, this book is an important resource formechanical and aerospace engineers who design aircraft engines orvirtually any type of turbomachinery. HELMUT E. WEBER, ScD, is President of Flow Energy Engineering. He has worked in the field of engine design for more than thirty-five years and has patented a number of innovative devices including a turbocompressor wave engine. His professional positions have included President of General Power Corporation, manager with Scott Paper Company, and manager with General Electric Company. He has also worked as a consultant to a number of prestigious corporations, including Leeds and Northrup, Science Applications International, Ingersoll-Rand, and DOE. His academic positions have included Assistant Dean of the Graduate School and Professor of Mechanical Engineering at Penn State University. He has also held academic positions at the University of California, Berkeley, the Naval Postgraduate School, and MIT. Dr. Weber earned his ScD, SM, and SB degrees from MIT. Applications of Time-Dependent, One-Dimensional Flow with ShockWaves. Design of the Wave Rotor. Seals, Materials, and Blade Temperatures. Losses, Flow, and Wave Approximations. Wave Engine Compounded with Gas Turbine. Off-Design Operation of the Wave Rotor. Preliminary Design of the Basic Wave Engine.